I spent the afternoon setting up an MMF 7.1 turntable with a nice Goldring cartridge. I spent this evening with a tall glass going through some of the new albums delivered to my door yesterday. What a world we live in. I returned the MMF 5.1 SE which did not have an isolated plinth so, I hated it. The 7.1 sounds great. Bob Marley Legends, sounded just terrific, The Man in Black (Ring of Fire, Walk the Line) Wow. I have to say, there is something about vinyl which sounds ... pleasing. I'm using the Kenwood KA9100 which is supposed to have a great phono section. My good friend is going to go into my ASL MG SI 15DT and swap out the busted output block (interconnects pulled the guts out). I think the SET tube amp with the turntable will sound even better. Anyway, spin your vinyl, let the electrons boil from the plates in your tubes and enjoy the music. Nice! I too enjoy an evening, or any time of the day, spinning some vinyl on an old Denon I have. One of my guests this weekend made this observation about the difference between music from CDs and music from Vinyl ... Music from Vinyl makes you want to dance. Ain't that the truth. This thaing sounds great!!! There is something about vinyl that is hard to describe , but not hard to hear.I dont have any bob marley but i have a copy of eddy grant( similar ) and it is an excellent recording. I listen to my TT almost exclusively , i really enjoy the interaction with it. My TT is over 30 yrs old but it sounds great , and with the advent of the internet i have learned alot about setup. Currently running a shure M94lt with a jico stylus . I have a grado reference Platinum 1 on its way to me. Also working on purchasing a Jolida jd9a which will sound much better than the pre built into my yamaha rx-a1000 im sure. Vinyl is here to stay. Mr. Socketman very nice to hear! I grew up with Shures, Garrards and tube gear. Tubes and vinyl, bagels and smoked salmon, some combos are magic. I must say that vinyl is a wonderful part of audio. I have owned and enjoyed several TT's over the decades - most notably a Linn LP12 and an Orcle Delphi (forget whether it was Mark III or IV). Comparing the sound of good quality media always made me favour vinyl. However, the plain fact of it for me is that the handling requirements have led me to CD's and high quality downloads. No question about it Mike, vinyl is high maintenance. Your turntables are iconic. May I ask what equipment do you use with those beauties? Well, as mentioned, these were over the past 10+ years - my current setup is M80's driven by an NAD amp, NAD cd player, iPod...and I have a Thorens TD 280 (Grado cart, vanden Hul silver tonearm leads). ...and then I shelved the hobby, and went on to other things - like kids and an ex wife!! the kids will grow up and the ex will eventuaLLLY go away lol then its will be your time. Yes, well, ex wives can be even more expensive than the audio hobby. 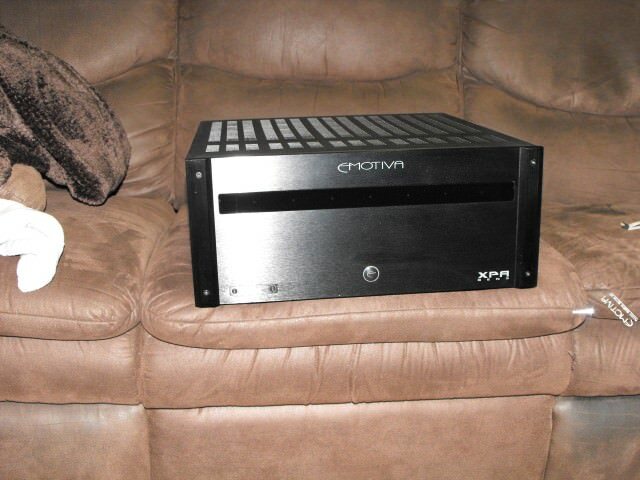 I swap speakers around, Dahlquist DQM 905s, Michaura M66s, Michaura M55s, Axiom M22s sitting atop a pair of 12" subs. I have resisted using towers in my 2 channel systems, dunno why. Maybe someday I'll sneak in a pair of M80s.